Manhattan Village is a highly desirable gated community located in Manhattan Beach. This prestigious planned community offers beautiful landscaping, a private pool & spas, access to Manhattan Country Club, and 24-hour guard security? to name a few. This premium corner Plan 8 two-story Townhome offers approx. 2,045 sq. ft. of living space featuring an Entry, Family room with hand-crafted masonry fireplace, remodeled Gourmet Kitchen with granite counter-tops, Dining Room, Living Room and powder room all on the first floor. The spacious Master Suite offers a luxurious bath and closet. The second floor offers two additional bedrooms, full bath and built in office area. 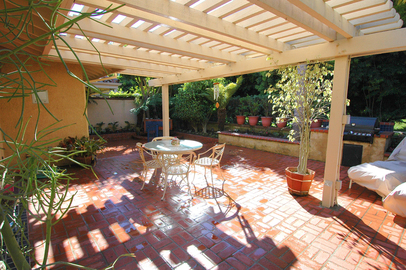 The property also boasts a landscaped rear courtyard with fountain.